or is it in reality - 3D Printing Walls? 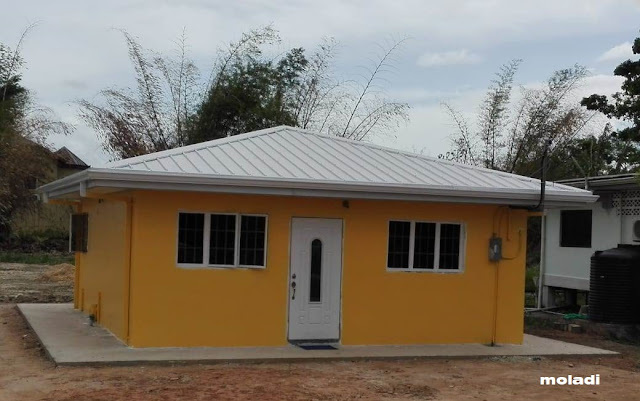 Are 3D printed walls really the solution to address the backlog of quality affordable homes? This particular printer was installed in a factory/covered area and produced wall segments - not the complete home or walls of a house. 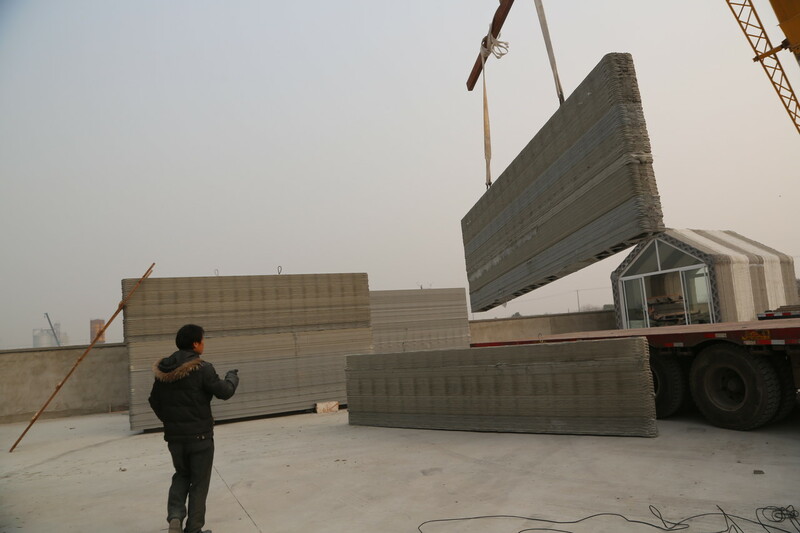 In the case with Winsun, the panels/sections where printed in one area (the factory) then transported to the site where the precast/pre-printed sections/segments where lifted into position by crane. In a sense this process of printing transporting and erecting is exactly the same as precast, just slower. 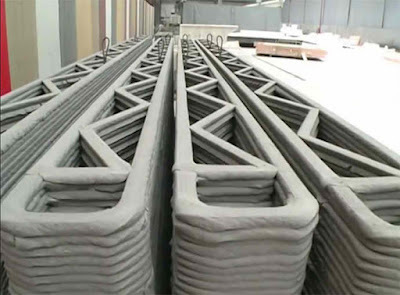 More panels can be precast in moulds than a printer can print. After printing with fibreglass reinforced cement mixture, the sections need to harden and cure before being moved or lifted - This time delay will vary depending on the cement content - temperate - reinforcing - configuration of the section (ribbing) etc. But one thing is sure...it cannot be erected after printing (wet). This means stock has to be produced waiting for the earlier sections to cure and this means cost. It is difficult to calculate the cost of a square meter of wall as this information is not available nor made public. The real issue is that the wall consist of a small small part of construction cost. 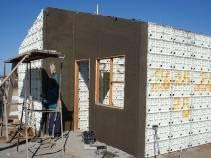 We found that when you look at a house holistically and break it up in segments it is clear that one is not able to drastically reduce the cost of the house simply by printing the walls. Firstly, the printer has to be positioned/erected and levelled before it can start printing the walls. The walls need to be produced on a engineered foundation for the soil conditions of that particular area (manpower and skills) – a level flat platform. In the walls will have to be the electrical pipes and water pipes (manpower and skills). The window and door openings need to be filled with windows and doors (manpower and skills). The roof needs to be fixed (manpower and skills). Then the ceiling needs to be fixed (manpower and skills). By the photos you will see the printed walls are very rough, therefore they need to be plastered (skilled artisan) and painted (manpower and skills). Once the walls have been printed layer for layer (cannot raise more than 500mm per print – material needs curing) over a period of 24 hours (weather permitting) the printer has to be dismantled moved and re-erected on the next site/foundation. Naturally the cost of the printer needs to be amortized over the amount of houses it needs to print The “running cost” of the printer is also a big factor on the cost of wall or cost per house. 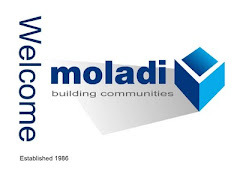 Electricity in some areas are not available therefore a generator would be required to run the printer…and diesel or petrol…and spare parts… We are fortunate to have started the development of moladi in 1986 - This allows us to understand what it takes to produce a house in a day employing local labour (benefit to the unemployed) and speeding up the construction process. "Winsun is a fake" - "It is neither efficient nor revolutionary, and instead is much more expensive and inefficient than current manufacturing techniques"
A machine designed to do what man has done hundreds of years ago...We need to provide not only shelter for the have not's, but more importantly "income" so people are able to support and sustain themselves (food). 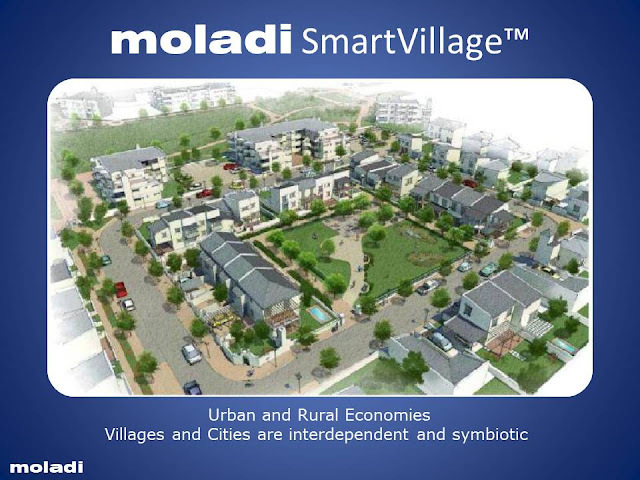 Therefore job creation is key to sustainable human settlements. For a moment, think about the logistics of getting this printer to a village in Africa. Then the setting up of the printer...then the peripheral needs of the printer - power...generator...diesel...then a particular soil..mud..cement..etc. then print a rondavel. A wattle and daub hut or rondavel is how local rural people build vernacular structures for hundreds of years...Therefore the question - is it viable? Does it benefit society or the "have not's"? At the latest WEF meeting in Davos, emphasis was placed on “Impact of job-stealing robots a growing concern at Davos” - "Jobs will be lost, jobs will evolve and this revolution is going to be ageless, it's going to be classless and it's going to affect everyone," said Meg Whitman, chief executive of Hewlett Packard Enterprise - "Over the last decade, more jobs have been lost to technology than any other factor, and John Drzik, head of global risk at insurance broker Marsh, expects more of the same” We cannot sell homes to unemployed people nor can we afford to give homes to unemployed people at no cost. Maslow’s hierarchy of needs are depicted as “Food and Shelter” as the basic fundamental need. We believe that he took it for granted that one would have a “job” producing “food and shelter” – Therefore it can be interpreted as "Jobs" producing “Food and Shelter” – Jobs mean income - Income means money to spend on food and shelter (and clothing and a car)– therefore it’s not the cost of printing homes in monetary terms – it is at the cost of humanity and provision of basic needs.